Kharkiv Regional Administration head Ihor Rainin told UNIAN about separatism in Kharkiv, how much pay the perpetrators of terrorist acts were given, the complexities of the refugee issue, and the influence of Kharkiv Mayor Hennadiy Kernes and former governor Mykhailo Dobkin. From April to November 2014, Rainin worked as the first deputy head of Kharkiv Regional State Administration, and, in his words, a year ago the emergence of a “Kharkiv People’s Republic” was even more possible than in Donetsk and Luhansk. And if not for the timely measures aimed at stopping separatism, Kharkiv would have faced the same unenviable fate as the neighboring regions of the Donbas. 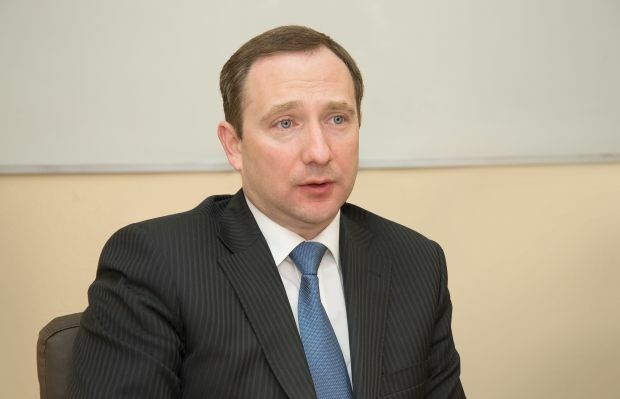 After three months of work as a deputy head of the Presidential Administration (PA), Rainin returned to Kharkiv region with the new status of top regional official. In an interview with UNIAN he spoke of the difficulties the region is facing, and what ways of overcoming them he sees as governor. - Whose idea was it to get you back to the Kharkiv region and why did you agree to leave your job in the Presidential Administration for the governor’s post? - The idea came from the chief of the PA Borys Lozhkyn, and it was supported both by the president and the prime minister. We saw that Kharkiv was gradually “heating up,” in particular, under the influence of external factors. Therefore, all agreed that there was a definite need for my appointment. Kharkiv is just 40 km from the Russian border, large amount of settled areas are situated directly at the border with Russia. Professional Russian propaganda is quite active. Sometimes, I think that if an ordinary person watches Russian TV channels for three days straight, they might get sick. Of course, all this has its influence. When I arrived in Kharkiv from Kyiv in February this year, my hometown was perceived as being as hot as a frying pan. We have cooled it a bit - and that's a fact. Gradually, we’ve begun to neutralize the influence of the forces, including local councils, which could destabilize the situation in Kharkiv region. I’m deeply convinced that, for example, the “Opposition bloc” did set such a goal for itself. But now it is no longer possible. I think that we have been working on this issue quite effectively. And I can say with confidence that the “hot phase” of separatism has been removed from the agenda in this region. Now the pro-Russian forces in Kharkiv are no longer as strong as they were before. We are gradually moving towards a civilized public debate, we take plenty of counter-propaganda measures, the propaganda of Ukraine. Today, Kharkiv is “colored in the yellow and blue” [colors of Ukraine’s national flag]. - How well is the border protected within the Kharkiv region? Is “The Wall” being built, or maybe some other fortifications? - Of course, in the current situation all mechanisms are needed to allow for the strengthening of border defenses. Another thing is that it can’t be just “The Wall.” There must also be a first line of defense, a second, and a third. And we will be strengthening these lines. There is a certain height near Kharkiv in the direction of Russian border, and we are now building a platoon strongpoint on it. There will be all the necessary facilities there in order to complicate the advance of the enemy. To date, defensive systems are being built in the areas of Belgorod, Volchanskiy and Zolochiv. We want to do everything properly. We don’t want to build a strong point that can be easily circumvented with a one kilometer detour. - Whose initiative was it? - And have the authorities in Kyiv supported this? - This project fits into the initiative of the president on the construction of fortifications along the contact line in Donetsk and Luhansk regions. In Luhansk region the defense line will be built by the Kharkiv regional authorities – that is 31 platoon strongpoints. We will have military specialists working there. But the situation today urges us to start building right now, while the money will come later. Construction companies are helping us; construction teams have already been formed and are working in the Luhansk region. Here's an example of Kharkiv’s patriotism. No company refused [to contribute]! - Another question on this theme is about internal migrants. How does the regional administration work with them? - Officially, we have registered 152,000 internal migrants. Unofficially, there are about 300,000 of them, that is adding relatives of migrants who moved later or those who have some money to get by (and they don’t seek help from the authorities). No other region of Ukraine has welcomed more internal migrants. Imagine, it’s like we moved the whole population of Poltava [another regional center] to Kharkiv. Can everything be alright in such case, given that we have faced such a challenge for the first time ever? It’s understood that it can’t all be perfect with health and education. Also, tremendous social and economic pressure on the regional economy has added up. But we ought to help, because these are our citizens, despite the fact that their political views are very different. We are a single country. We are building and improving a certain system of aid and assistance. When a migrant comes to town, he is told all the phone numbers, where to go and what to do to get help. He is almost led by the hand - registration, medical examination, registration with the Migration Service, Social Security and so on. - Quite often we hear about the activities on the territory of Kharkiv of various saboteurs who organize terrorist attacks, inflict damage on infrastructure. What needs to be done to stop them? - Kharkiv region stretches along 600 kilometers of tense border lines: 300 kilometers with Russia and 300 kilometers with Donetsk and Luhansk regions. This is a serious destabilizing factor. For you to understand how complicated it is, I’ll tell you that for the attack near the Sports Palace the perpetrators were promised $10,000. For a shot from a grenade launcher, for example, another $300 is promised. Nearly ten subversive groups are operating in the region. But there are also “frozen” groups. So when we knock out an active group, another “frozen” team replaces it, and meanwhile, a new group is prepared. The instructors in these groups are Russian citizens, and the “expendables” are citizens of Ukraine. They are trained in Belgorod, Rostov and Tambov. The main thing I want to achieve is to calm down the situation in Kharkiv, hold a peaceful celebration of Victory Day on May, 9 and finally restore a peaceful life in the region. - Has the governorship got sufficient powers to restore order in such difficult conditions? - The regional administration, first of all, coordinates, organizes and lobbies different processes. The head of the regional administration, unequivocally, is the top regional official. And we have a certain unity of command, although many, of course, might not be happy about it. Whether you are ready to make decisions and take responsibility for them is of key importance. These are the times we live in. Anyone who is a sufficiently resolute person actually is a strong public manager. I can give you an example – April 6, 2014. There were sieges of three regional administrations, by the same scenario: in Donetsk, Luhansk and Kharkiv. In Donetsk and Luhansk nobody decided to storm the regional administration. How come? It’s because at that time, nobody had been killed yet, and the officials in Donetsk and Luhansk, including the governors, were afraid to act. Of course, every human life is precious, but we know that in the end not just two or three people died, but thousands. But in Kharkiv region we made the decision, we stormed [the administration building] – and no one got killed, thank God. Then there was the tough cleansing, which lasted almost for the entire April. At that time, Kharkiv was saved... For example, the Jaguar special task force unit from Vinnitsa stormed the building of the regional administration, because at that time we could not fully trust the Kharkiv police units. There was no plan of the building, nothing. In the bus they drew up a rough plan-scheme. The guys worked like real professionals, and in 15 minutes they restored order. If we thought about coordination of our actions [with our superiors], there would already have emerged some “Kharkiv People’s Republic”, while Kharkiv would have become the capital of Novorossiya, because that's what they were planning. All these rascals - Gubarev, Motorola and others were in Kharkiv back in April. Had all the processes gone this way, Kharkiv would not have remained a Ukrainian city. - How do you get along with the mayor of Kharkiv, whose influence in the region is considered substantial enough, as well as with the representatives of local authorities from other cities? - In Kharkiv region there are seven cities of regional importance. Kharkiv is the region’s center and is the largest of them. But I do not make any division in my attitude toward the city of Kharkiv, or the towns of Kupyansk or Pervomaisky – they all have the same status. Everybody will implement my instructions in the legal framework very swiftly, as a team. Actually, [as for] Kernes [the mayor of Kharkiv] … I have had no problems with him in terms of discipline in the last six weeks. And his influence on the processes in the region has significantly decreased recently. Another thing is that the corruption schemes have sprouted so deeply in the city council that it is impossible to just tear them out. Plus the level of political mistakes made by the Kharkiv mayor makes them impossible to ignore. - That's not quite true. As of today, five criminal cases have been opened in regard to utility companies of the Kharkiv City Council, concerning Gorky Park, “Zhilkomservice”, “Harkovkommunprovod” and others. There is an investigative team from the General Prosecutor's Office and from the Interior Ministry, and this group is now conducting an investigation of relevant cases. Whether the investigation is swift or delayed - this is a question to address to that group. - And do the law enforcement officials have anything on Mykhailo Dobkin? Or maybe we will hear about them in the near future? - Dobkin enjoys an immunity status as an MP. But I do know that the law enforcement officials are carrying certain measures. There are no criminal cases yet, but they may possibly be opened. - Could you describe the picture of the region, which Dobkin left behind? A year ago, you were the Deputy Governor, you were obviously familiar with it. - At the time of the arrival of the new team, the situation in the region in economic terms was “full of confusion and hesitation.” For example, the debt on Treasury bills remained at the time at the level of around UAH 600 million. By the end of the year we managed to reduce the debt to UAH 200 million. The payments were still to be collected, as even the planting of crops was done almost under fire. It was necessary to convince farmers that there was a need to plant. Agricultural business always has increased risks, and this time there was is a real prospect of losing everything. But we convinced them and then got a record harvest in the Kharkiv region. - Previously, plenty of the Kharkiv region exports went to Russia. How has the situation changed today? - We have lost a significant amount of the market, Crimea alone had about a 5% share [of our exports]. The Russian market was very convenient for us. Firstly, requirements for the quality of goods are lower than in Europe, and secondly, there are convenient logistics at lower costs. But it was not us who started the war, and, as they say, “the trouble has helped.” Otherwise we would not have reformatted our markets. And they have long had to be diversified. Because when there’s just one partner in the business, it's always bad. And wherever the management realized this, it created a “cushion” of additional orders. And wherever the management consisted of “red directors” [Soviet-style management], the loss of 80% of the Russian market was fatal [for those companies]. - What do you think about the greater independence of the regions, decentralization? In your opinion, will this lead to positive changes? - First and foremost one needs to understand the main purpose of decentralization. I am not a supporter of political decentralization, but if it is carried out in economic field, I give it two hands up. It’s just that it does not necessarily mean amending the Constitution - it is enough to make changes to the Budget and Tax Codes. For example, after changes were made to the Budget Code, we have been able to add another UAH 3 billion to the regional budget. It is certainly necessary to continue decentralization in this direction. - Local elections are scheduled for this autumn. What are your predictions for their outcome in the Kharkiv region, based on local sentiments? - I’m deeply convinced that the democratic political forces prevail in Kharkiv today. The main question is what will be the process of consolidation and integration like, what will be the tactics of pro-Ukrainian democratic forces. But I think that we will be able to form a majority [out of these forces] in the regional council. We have recently adopted a strategy of development of the region, and it turned out to be a good plan of action. So, among the deputies of the regional council no one voted "against" [the strategy]. This suggests that we have succeeded in uniting the regional council around us in a short period of time to make important decisions for the country, rather than voicing any separatist rhetoric. - Who would you call you companions and your opponents? - The people who led the country to war – the representatives of the Party of Regions and the “Opposition bloc” are definitely not my companions. Even when I could benefit from cooperating with them, I abstained. And then my conscience is clear to the people. I have never had any contact with the Party of Regions, and I will not have any, because they are not my heroes. At the same time, am willing to consider as my companions all the people that are eager to work constructively.